992cc 90deg V-twin 4-stroke desmo, liquid cooled 3 valves per cylinder. Marelli electronic injection with 50mm throttle bodies. 6-speed gearbox with hydraulic multi-plate wet clutch. CAN-Line electronics. Twin aluminium mufflers with 3-way EURO 2 cat. ALS450 trellis frame. Showa 43mm USD front forks with preload adj. Rear Showa monoshock with compression rebound and preload adj. Twin 320mm front discs with Brembo 4-pot calipers, single rear 245mm disc with 2-pot caliper. Okay, I'll admit it - I'm biased. You see I used to have a Ducati ST2 that I bought about four years ago to take myself and my daughter touring around France and Spain. I used it for a couple of years until my daughter passed her bike test, then decided that going on holiday with the parents "wasn't cool" anymore, and anyway I needed the space in the garage. But I was sorry to see it go because it was utterly reliable and for 2-up press-on traveling with luggage it was hard to beat. Alright, the engine was a bit asthmatic over 7,500 rpm, the headlights weren't the greatest on the planet, and at low revs the vibes almost had the clocks jumping out of the cockpit. But it was supremely comfortable, handled well around the twisty bits and pulled like a train even when loaded up with the veritable kitchen sink. 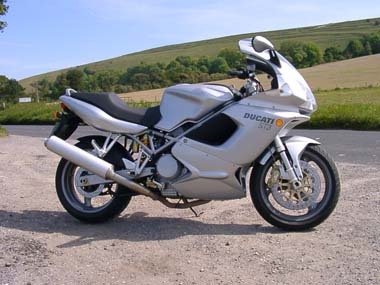 Back in 1997, the idea of going touring on any Ducati was thought by many to be an act of complete lunacy. The words "Ducati" and "Reliability" were not often found in the same sentence and even devotee riders of the Italian marque seldom ventured far from home on their own. Having a mate following behind was considered essential to collect 'freedom-seeking' parts, and you never knew when you might need a lift home. Breakdown cover was a mandatory part of ownership. So when Ducati launched the ST2 under the label "Sport Tourismo", many people thought the company had finally cracked or maybe developed a sadistic sense of humour. 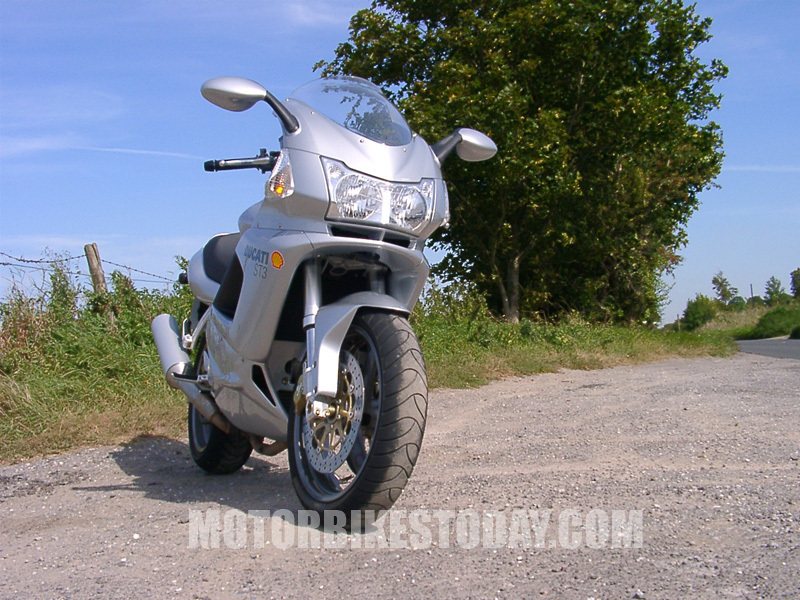 But the bike worked, and it gave Honda and its VFR a bit of a wake-up call. Over the next few years it spawned both the ST4 and ST4S with bigger and more powerful engines, until at the end of 2003 it got a complete makeover and a new 3-valve engine, and metamorphosed into the ST3. The most striking thing about the new ST3 is the front fairing which is much sharper and angular than the old design, but still houses separate projector headlamps for main and dip beam which are much improved over the originals, and can even be adjusted electrically when you're sitting on the bike. And in the saddle the other thing you notice is the size of the fairing which at first is a bit like sitting behind a glass barn door. Strangely enough it doesn't seem to offer any more wind protection than the smaller original when you're on the move, although I wasn't able to test its rain-deflecting properties as amazingly it didn't rain the whole time I had the bike on test. The rest of the bodywork is unchanged, and I wouldn't be surprised if the old panels weren't interchangeable with the new. However, underneath the fairing panels the ST3 now sports an acoustic waistcoat, no doubt as a result of the ever more stringent environmental regulations that regularly appear from Brussels. Like some of their Japanese counterparts, Ducati have started to improve bike security, and the ST3 uses a coded ignition key and immobiliser like the Honda HISS system. The test bike even had a U-lock carried under the seat, although I'm not sure that this is standard equipment. 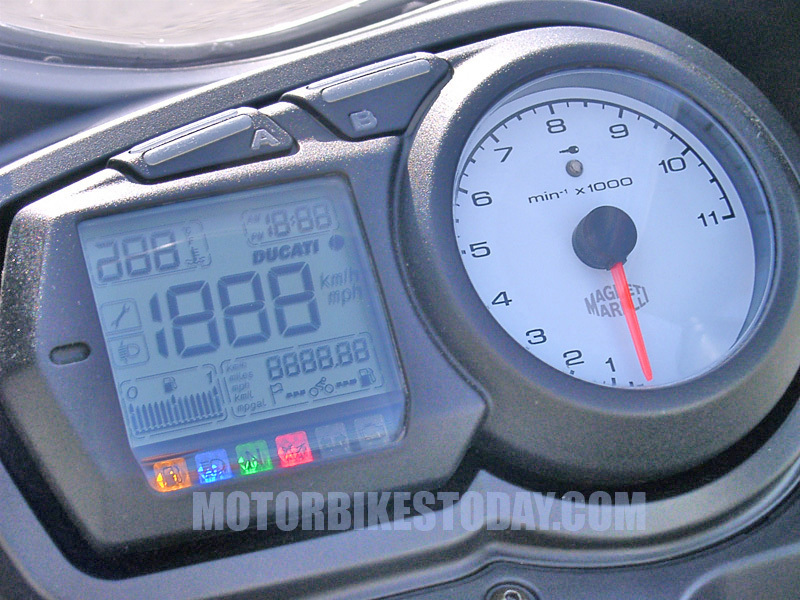 Anyway, a turn of the ignition key lights up the Multistrada-like instrument display, and the multi-function lcd panel goes through a test sequence, tells you that this is an English ST3, and then settles down to display speed, fuel level, coolant temperature, distance traveled and the time. By pressing a couple of buttons at the top of the unit, the odometer will also show trip distance, average speed, instantaneous and average fuel consumption, fuel used, the number of miles before you need to fill up, and the number of gallons left in the tank. Unfortunately, whatever kind of display you choose, the system resets to show total miles traveled whenever the ignition is switched on. But on the plus side it's easy to switch the display between miles and kilometres for those continental jaunts. Thumb the starter button and the engine turns over in a typically lazy V-twin manner that makes you think the battery's gone flat. But after a couple of seconds the engine rumbles into life and then settles down to a strangely erratic tickover, that could indicate a problem with the fuel injection system. Pull in the clutch, which is surprisingly light for a Ducati, snick it into first, and you immediately notice the difference in the engine. This is a really willing unit which pulls hard right the way through the rev range. The extra inlet valve on the 3-valve head really does the business. Gone is the old wheeziness in the upper part of the rev range and yet it still develops masses of torque from low revs that makes overtaking a breeze. Pick up is good at all revs and the engine never really seems to be working hard. In fact it's so relaxed that its quite easy to be cruising along at three-figure speeds and then suddenly realise there's another cog in the box. There's very little vibration at any speed, just the usual V-twin rumble to remind you that this is a Ducati. The gearchange itself is no great shakes, and requires a firm prod with the left boot to select a gear. On a number of occasions I also managed to find a false neutral between 4th and 5th, which was something you don't really expect to find on bike these days. The other surprise on this bike was a wet clutch. Yes! - you heard right - a Ducati with a wet clutch! This was a severe shock to the system. No more rattling like a bag of rusty nails in neutral, no more embarrassing stares in traffic queues, no more having to explain to the uninitiated "they all do that", I can tell you it takes some getting use to. 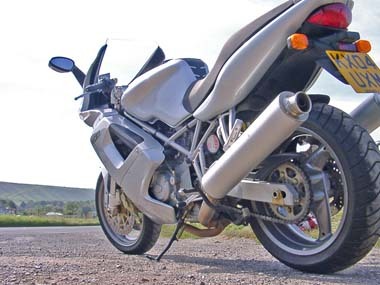 It turned out that this ST3 was a 2005 model, and Ducati UK believe that the ST4 and ST4S will also have wet clutches next year. But if you buy a 2005 bike, you'll still have to remove the right lower fairing panel to top up the oil level, as Ducati haven't taken the opportunity to move the oil filler plug from its old "dry clutch" position to a more accessible location on the clutch cover. On the road the ST3 still has the good handling characteristics of its predecessors. For normal riding the suspension is firm and reasonably well-damped and the bike turns well and holds a good line through the corners, although it does need a firm hand to get it well leant over. Stability is excellent and the bike never feels as though its going to get out of shape through the corners. This is a bike that likes to be ridden, although it's equally comfortable clocking up the miles on the motorway or autoroute, just so you can get to the good bits a little bit sooner. The new lighter clutch also makes it a much better experience to ride around in towns and in traffic, although the typically limited Ducati steering lock means that you still need a very wide piece of tarmac for that feet-up U-turn. The problems only come when you start to up the pace, and then the budget front forks begin to lose the plot. They are far too softly sprung and under-damped for real sporty riding, and with only preload adjustment to play with there's not a lot you can do about it. The situation is compounded by the excellent Brembo front brakes, which although having the power to haul the bike's speed down very quickly with a two-fingered pull on the lever, also have an alarming tendency to grab. 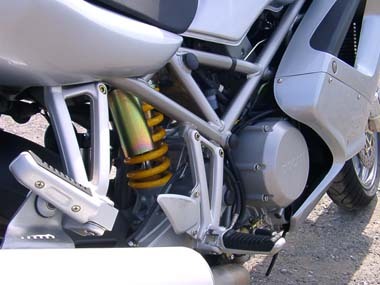 This momentarily surprises the soft front suspension and causes the bike to pitch forward dramatically. It's even worse when you're riding 2-up, and you'll need to be very careful with the brakes if you don't want your pillion hitting you in the back every time you try to slow down. Unfortunately, using the rear brake to balance the bike is not going to help you here, as the pedal has no feel at all and appears to contribute nothing towards slowing the bike down - until it locks the back wheel! Although the height-adjustable clip-on bars are a nice feature for a touring bike that's designed to be sporty, I'd much rather have some properly sprung, adjustable front forks that allowed me to quickly set up the bike for either 2-up touring or solo press-on riding. How about transplanting the forks off the ST2? And before you get too carried away with those adjustable bars, Ducati forgot to include the tool to loosen the clamp bolts in the toolkit! The rear suspension is a much better sorted affair, but even here there are some anomalies. The spring rates are good and everything's adjustable - if only you could get to it! The compression adjuster is masked by the left-hand heel plate, you'll need to remove the right side of the tailpiece fairing to get to the rebound adjuster on the remote reservoir, and adjusting the preload is something else. Ducati thoughtfully provide you with a C-spanner to do the job, but the adjuster ring is masked by the remote reservoir on one side and the frame tubes on the other. You can't even change the preload by altering the length of the tie-rod like you can on the ST2 and ST4, as this is a one-piece casting on the ST3. The only practical way left is to use a drift and a large hammer, so make sure you pack these in your tank bag every time you head off on holiday. There's a new engine management system to go with the new 6-valve engine, which uses the same CAN-line technology as Formula 1 racecars. According to Ducati, this is the first time such a system has been used on a bike and has allowed them to simplify much of the electrical system and save 3.5kg in weight. So it's surprising that the ST3 is 5kg heavier than its predecessor, although the extra weight is not really noticeable. What you do notice though is the way the engine hunts and shakes on a closed throttle below 4,000rpm. It's as though there's unwanted droplets of fuel leaking out of the injectors, or the throttle butterflies are vibrating slightly or are out of sync. On its own this wouldn't be too bad, but when you add it to the soft forks and the snatchy front brakes, the whole "coming to a halt thing" becomes something of a jerky experience. Sure, with a bit of practice you can ride around the problem, but in the 21st century should you have to? I started out on this test, looking forward to riding an evolution of a very capable bike that had been such a pleasant experience to own, but after two weeks of living with the new ST3 I wasn't too sorry to see it go back. Now it could well be that the injection problems and the grabby brakes were a one-off on the test bike, which after all had probably been given a hard time by fellow journalists who are not known for lavishing loving care and tenderness on the bikes that they use. However, there's no getting away from the fact that the suspension set up on the ST3 is a step back rather than an improvement on the ST2, and is less than you'd expect from a bike that's targeted at the sporty side of touring. Read external Ducati ST3 reviews on Ciao.